He believed that drug-sniffing bunnies were a real and cost-effective method of law enforcement. Dave Gautreau, a Republican mayoral nominee in Phoenixville, Pennsylvania, had a bad hare day. The political hopeful was speaking about cost-effective alternatives for local drug enforcement at a mayoral forum. There, he confidently proposed that instead of bringing in costly drug-sniffing K9 units they could take advantage of, what he believed to be nature’s other vice unit, fluffy, narco-rabbits. 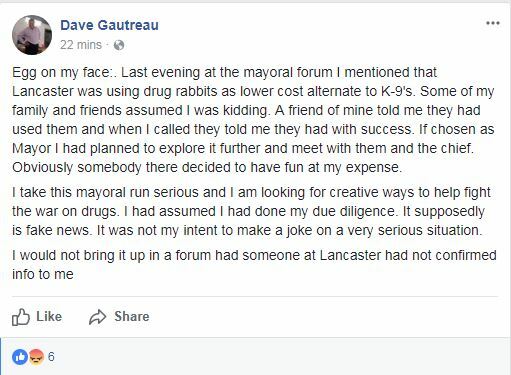 Gautreau claims that he first heard about drug rabbits by a friend, that Lancaster, Pennsylvania police were using them and that they were cheap. Gautreau even told the Philly Inquirer that he did his due diligence, calling someone in Lancaster (he couldn’t recall if he called the police or city hall) who confirmed the bunny tale. Lt. Bill Hickey of the Lancaster City Police said that couldn’t be true. “I can assure you we do not use any type of rabbits in our law enforcement activities, nor do we have plans to,” said Hickey.